Does anyone know this quilt? Thread: Does anyone know this quilt? I hope I am posting to the correct thread. 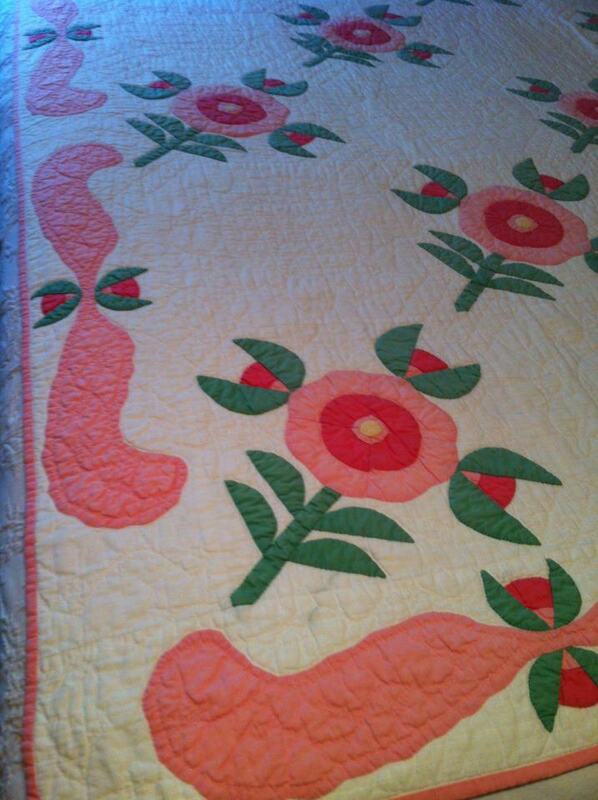 I have a friend who received this quilt top from a relative and only knows it was made by their GGM. Does anyone know anything about this pattern ( date, name, etc). Thanks in advance. Rose of Sharon. Princess Feather in the border. Green used might indicate 1930s. Not a clue! Sure is a pretty quilt!!! Not a clue here either. It is pretty and looks old. Looks very 1930's to me, too. I think it's a finished quilt, though, not just a completed top. Very pretty! Rose of Sharon, 1930's, Bubble Gum pink is a good possibility for the blossoms. In Barbara Brackman's book, Encylopedia of Applique, there are many variations of Rose of Sharon, but after carefully going through her sketches of each design I didn't find one that looked like this. It is possible the maker used her own creative juices in breaking the traditional pattern apart. Many times a quiltmaker would put her own twist on the name of the pattern. To quote Barbara, "Symmetries moved away from the formal, four way mirror image or the bouquet of three blooms. Flowers undulated across the block echoing art nouveau naturalism. Blocks often featured a single flower rather than a symmetrical bouquet." Her comments were made following her research into the 1920's change in trends. I would agree with above comments about it being 1930's - 1950's .... I have a similar quilt made by my great grandmother that would have been made sometime/anytime during this time. It seemed she liked to make the same pattern in different ways.